First 100 Bluebox Basic version will be send out 28h of January 2019 (early bird). Than shipment is handled on first paid first basis for order that we received full payment for. So much that machines started making negative income But no worry, next generation machines would soon come out and get mining profitable again. And they did come, but for our great disappointment, the jump in terms of efficiency from previous generation wasn't as high as before and they didn't save the profitability. There is now a new kind of 'mining' you might have missed until now which requires only a fraction of electricity compared to ordinary mining. And just like Cryptomining used to be out of average users reach until ASIC Miners came, similarly we managed to provide a plug and play PoS device which is as easy to handle as ASIC miners. Just plug in an ethernet cable and power it on and you are set. Technically it doesn't mine, instead it acts as Masternode, but from the users point of view, there isn't really difference. Before the Bluebox, you bought brand-x spiderminer-x9, powered it on, connected it to internet, tweaked some settings, and you were good to go. Now, you will buy bluebox, power it on, connect it to internet and you are good to go. Same as before, but now your machine wont get quickly obsolete because of rising difficulty of 'proof of work' and / or any changes on algorithms. For 'proof of stake', power is not an issue, and you might well be using same machine for next ten years. In 'proof of work' If you wanted to mine other coin, you had to buy another ASIC machine. In 'proof of stake', same machine can handle any coin. And this is where we jump in. We will be remote controlling your Bluebox, and setting up and removing masternodes from it. All you need to do, is to collect the rewards and keep the device connected to the internet. In 'proof of work' we would get thousands of miners under same small space managed by a small number of individuals which resulted in centralization, and then rent you hash power. But due to the nature of 'proof of stake', it is better to have thousand devices in thousand different locations. This puts the word decentralisation to a new level. With Bluebox, you buy and may still hope for good profits, but even if good profits don't come, you will still get your money back by us paying your internet. What stays is a device never getting obsolete and a truly decentralized Proof of Stake Network. The bluebox will significantly change the acceptance of decentralised blockchain system. The bluebox is decentralisation of an energy effective Proof of Stake based blockchain. The Bluebox consumes 20W at max. plus a few Watt for optionally connected harddrives. Compare this to the 2000+W of Bitcoin Miners and you got the point. It is also prepared for Proof of Storage and Proof of Work complementary chains of the Transcendence Blockchain. The Bluebox allows us to provide the foundation of an democratic cloud file storage which allows everyone to host files and information to build a open and public database for human knowledge. Also every Bluebox build the foundation of an decentral marketplace for programmers and artists. The Bluebox connects with us and serves for example the Transcendence Blockhain as well as participating 3rd parties. The Bluebox can be seen as decentral datacenter which holds Virtual Servers. Those run Masternode deamons to serve POS blockchains or offer a p2p file storage for Proof of Storage based Webstorage services. Basically your SSD storage is rented by others and parts of the revenue comes back to you. Also in case the build in OpenCL unit is used for computations by paying 3rd parties your Bluebox gains a share. A Bluebox is basically like a virtual Datacenter containing Virtual Private servers. The common problem of Masternode based coins is that Mastenodes are often placed in the very same datacenter (at a few Hosting Companies) which is in fact causing "centralisation" and a high risk of Network instabilities when a single datacenter goes down or does Server Maintenance. We are currently working on adding more status information like HDD status and a score which is calculated based on uptime. As you see it is easy peasy.. All you need to know can be seen on the status display. Alternatively we will provide a free iOS and Android app which will also inform you about failures. What if you don't want free internet or phone ? No problem ! Than the PoS revenue will be higher because we don't deduct the costs for the Internetconnection. You can also add multiple Blueboxes to your network. If you device to get free internet, paid by the Proof Of Stake revenue, fees will only be deducted from the first Bluebox. The Bluebox is Plug and let Play which means you just need to connect them via LAN to your Router and we manage it and connect it to Transcendence Blockchain. How much can I expect to earn with Storage. It depends on how much storage is provided globally and how much is required / rented to 3rd parties or non-profit organisations. Revenue grows by more demand of coins which again are required to pay used storage. What you get for sure is free access to AmiCloud file-sharing powered by Transcendence Blockchain. Besides providing the foundation of the Cloud service Amicloud ProofOfStorage will also be used to pave the ground for the indieGO!-Appstore as used in the indieGO console. Get rewards and spend them for Music, Videos, Games and more. Please check DSL availability in your location before you place an order. If you know in advance that DSL with 16Mbit download and 10Mbit upload is not possible, please don't order. For more than 3 boxes you will need a 50Mbit down and 10Mbit upload line to match the requirements. IPv6-only-connnections are not supported. You will need a local infrastructure supporting both: IPv4 and IPv6 connection. If you are using other devices like streaming devices e.g. please take into consideration, that you need an even more powerfull DSL-connection. You can choose between a DSL-connection provided by us or your own DSL-connection. We just ask for an initial setup fee. After campaign ends you can also choose colocation as an option. The device will stay at our location. If you chose this option you will save the costs for shipping and toll. You can order Additional SSD's for your Bluebox in order to participate in Proof of Storage. Development of Acrylic and or 3D-Printed cases which are produced just in time based on demand. During the campaign we may also offer other forms of case.. there are no limitations because they are cut out via laser cutters or printed via 3D-Printer. So we can also provide mini clusters using 96 or 128 physical cores.. let us know what you need and we make it possible. This for example shows a case design for a small Cluster holding up to 6 times the computational power of the Pro Version. Dash Miner D3 and similar goes 90db (A) but stays around 84db(A). Remember that db is logarithmic.. this is nothing you want in your living room or next to your router..
Now let's compare the Antminer D3 one of the most remarkable Miner in terms of profitability... it dropped short after shipping so it was dead on arrival. People made loss and now you can use it to heat up your living room. We must admit that you can't heat your room with the Bluebox.. sorry : ) You can't have everything. The Antminer PSU is half the size of the Bluebox Pro. Final bluebox will be slightly smaller due to new connecting system as seen on the CAD-screenshot. Two HDD's can fit into the Pro-Model. Final version will allow to place 4 SSD's alternatively. 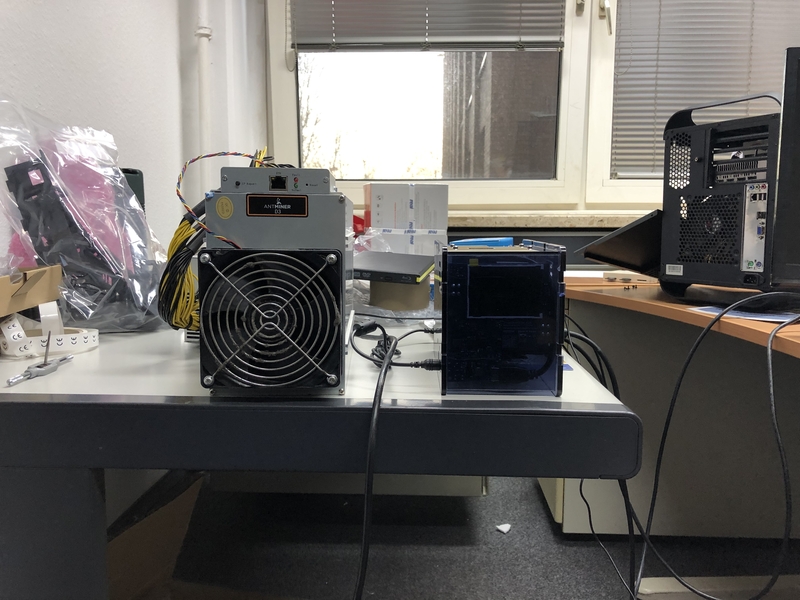 The Antminer can be controlled via Brother. The Bluebox Pro comes with a status display and also and mobile app for Android and iOS which informs you about miss-behaviour and general status. The value edition of the Box comes without the LCD and without SATA connectors. So it is only PoS in that case. The basic edition comes without LCD but has everything ready to connect one Hard-drive to participate in Proof of Storage. Every version can use external Hard-drives as well. It is also possible to add USB-ASIC for those wanting this. Our delivery dates are estimated for February and June 2019. If it is possible we will deliver earlier then mentioned on the top of this description. The bluebox is a result of a joint venture between ARES Computerwhich developed the indieGO retro console and the AEROS operating system which is again the foundation of the bluebox and Better Engineering GmbH as well as the Peerschweinchen UG. ARES Computer is also member of the Open Invention Network Better Engineering GmbH is responsible for the Hardware and Casedesign as well as additive manufacturing of the devices. The management of the Blueboxes is done by Peerschweinchen UG which runs a Mining service in germany. Known references of ARES Computerare for example the IndieGO console, AEROS, AresOne, AROS Broadway, Transcendence open source Blockchain, Telos Coin. 1. Please research on your local custom requirements before purchasing from us. In the case of any custom delay or shipment return we will not be held liable. 2. To prevent hoarding and to ensure that more individual buyers can purchase miners in this batch, we have set a limit of 10 miner per user. 3. Maybe for this batch, shipping will be arranged later than the estimated shipping time since Bluebox is a new product. However, we may ship it out ahead of the schedule once ready. The shipping for this batch will start on a first-paid-first-ship basis for orders that we have received full payment for. We advise you to research and prepare in advance for the customs' clearance in your country to avoid delays or unexpected costs. 5. Kindly note that power supply will be included. However, the power cord is not included, please find one with from your local market or order it optionally. 6. There are financial risks associated with mining cryptocurrencies. These risks can be related to changes in exchange rate of the cryptocurrency. We would like to reiterate that you should consider carefully before making a purchase because requests for refund or order cancellation will not be entertained for any orders in this batch. 10. To ensure the authenticity, high quality and full warranty coverage of products you purchase from us, we strongly suggest you to purchase through our official website (www.blueboxing.net) only and we will only be responsible for products purchased through our official website. Please acknowledge that we do not have any authorized third party distributor and reseller in any region or country. We will not allow our products to be sold by individuals through phone call, email or any other method. It could be a scam if you place your order with anyone claiming to be an official Bitmain sales representative/distributor via email or Skype or on any other website other than our official website (www.bitmain.com). We do not have any obligation to provide you with any compensation or indemnification in case of scam caused by third parties. The terms and conditions of sales of our products on our official websites are the only binding version and we will not in any event match any preferential terms offered by any other unauthorized third party distributor and reseller. 11. The pictures shows here are for reference only, the final shipment version shall prevail.